Premier Auto Trade is pleased to announce that they have entered into an exclusive distribution agreement with BMC Air Filter for the Automotive Air Filter product range in Australia and New Zealand. 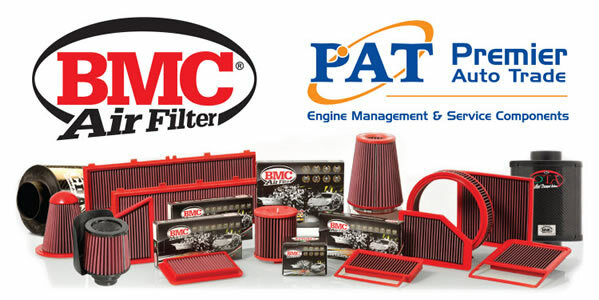 BMC produces the world's best quality air filters both for racing and for street use. BMC Air Filters, designed and manufactured in Italy, were originally developed in association with the Ferrari F1 team. BMC Air Filters is one of the most recognised brands in the automotive industry and are the most successful filter in many sports categories including; Formula1 champions 9 times, Australian V8 Supercar Champions 7 times, 10 American Le Mans titles, and 11 Le Mans 24 Hours titles. BMC has enjoyed many years of success in the Australian V8 Supercars Championship with BMC Team Partners winning 7 of the last 8 championships, and every Bathurst 1000 since 2005. In becoming the new Australian Automotive distributor for BMC Air Filters, Premier Auto Trade will offer the full automotive range including OEM replacement filters, Conical Filters both single and double air, the Carbon Dynamic Airbox (CDA) and the Carbon Racing Filter (CRF) range. Premier Auto Trade distributes products throughout Australia via specialised resellers and leading automotive retail groups.